With clean lines and a smooth glossy finish, this modern dining set is perfect for either formal or casual settings. The classic table has square block legs that taper slightly at the end and an apron with subtle accents. One leaf extends the length of the table from 60 to 78 inches. The set includes six dining side chairs with polyester upholstered seat and backrests. The Piper Modern Table and Chair Set by Elements International at Beck's Furniture in the Sacramento, Rancho Cordova, Roseville, California area. Product availability may vary. Contact us for the most current availability on this product. 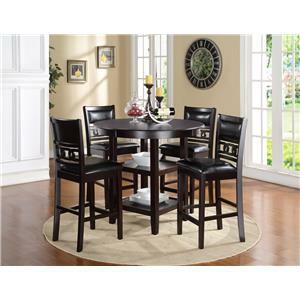 This collection is the perfect way to update your dining area with clean lines and a glossy smooth finish. The collection has a counter and regular height dining options available and would work well in either formal or casual settings. The Piper collection is a great option if you are looking for Contemporary Casual furniture in the Sacramento, Rancho Cordova, Roseville, California area. Browse other items in the Piper collection from Beck's Furniture in the Sacramento, Rancho Cordova, Roseville, California area.